Cerebral Revascularization: Techniques in Extracranial-to-Intracranial Bypass Surgery, by Saleem I. Abdulrauf, MD, FACS, offers unmatched expert guidance. Through a series of dynamic, step-by-step instructional videos of the most common and uncommon procedures, you will deepen your understanding of these techniques and be able to confidently perform them. 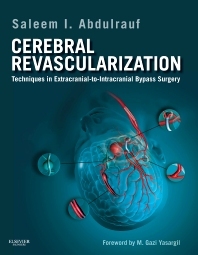 Edited and written by international leaders in neurosurgery, this definitive reference - with a foreword written by M. Gazi Yasargil, MD creator of the procedure – is the first and only text entirely dedicated to this surgery and provides you with exclusive, authoritative information. Access the full text, video library, and reference links to PubMed at www.expertconsult.com.